I happened to have everything I needed to give the little posies a try. At around the same time, I had gotten the cool tag punch. I thought a marriage between these two components would be nothing short of precious. Fold an 8 1/2" x 5 1/2" piece of Coastal Cabana cardstock in half, creasing well with a bone folder. 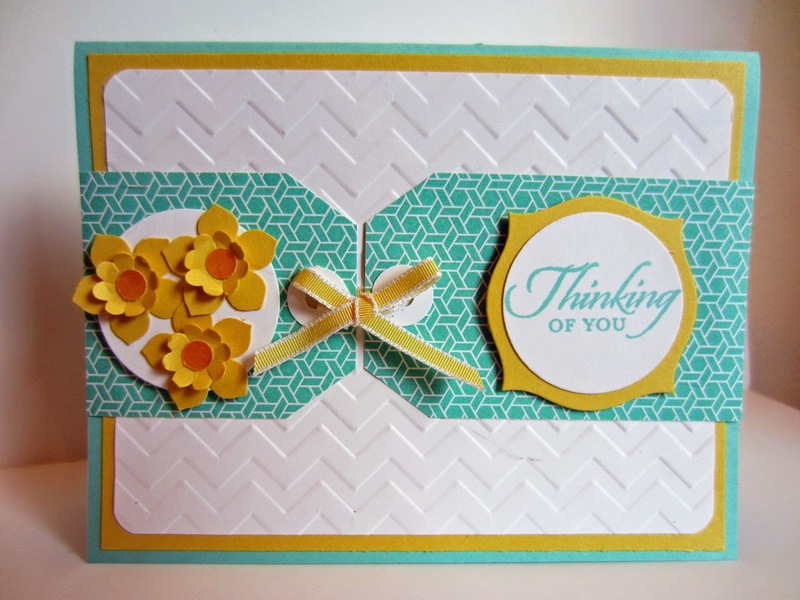 Adhere a 4" x 5 1/4" piece of Daffodil Delight cardstock to the card base. Run a 3 3/4" x 5" piece of Whisper White cardstock through the Big Shot inside the Chevron Embossing Folder. Round all the corners. Adhere the piece atop the Daffodil Delight. From 2" x 2 1/4" and 2" x 3 1/4" pieces of DSP, create two tags with the Tag Topper Punch. On a scrap of Whisper White cardstock, punch two holes with the 1/8" Circle Paper Punch about a half inch apart. Then surround the punched holes with the 1/2" Circle Punch and punch. Adhere these pieces over the holes in the tags you just made. Before you do the next step, make sure the portions of the tags that have the holes are not glued down. You need to be able to slip the ribbon through the holes. Adhere the tags, larger one on the right, smaller on the left, with their flat edges even with the sides of the card. Insert a piece of yellow ribbon into the holes of the tags and tie it in a bow to connect the tags. To make the daffodils: Punch out three of each type of flower. With each flower on top of the Piercing Mat, push down firmly into the center with the blunt end of a paintbrush, a piercing tool, anything you have on hand. This will cause the edges of the flowers to rise, giving it the 3-D appearance. With Glue Dots, adhere the smaller center onto the larger piece. Punch out three dots with the regular paper punch from Pumpkin Pie cardstock scrap. Adhere these to the centers of each flower. Play with the smaller flower by lifting the petals upward with your fingers so it forms the "trumpet" of the daffodil. With the Circles Collection Framelits, cut two 1 1/2" circles. Adhere the three daffodils to one white circle. Attach this circle to the smaller tag with a couple Stampin' Dimensionals. From a scrap piece of Daffodil Delight cardstock, use the appropriate Framelit from the Apothecary Accents set to cut a frame for the other white circle. On this white circle, stamp the sentiment in Coastal Cabana. 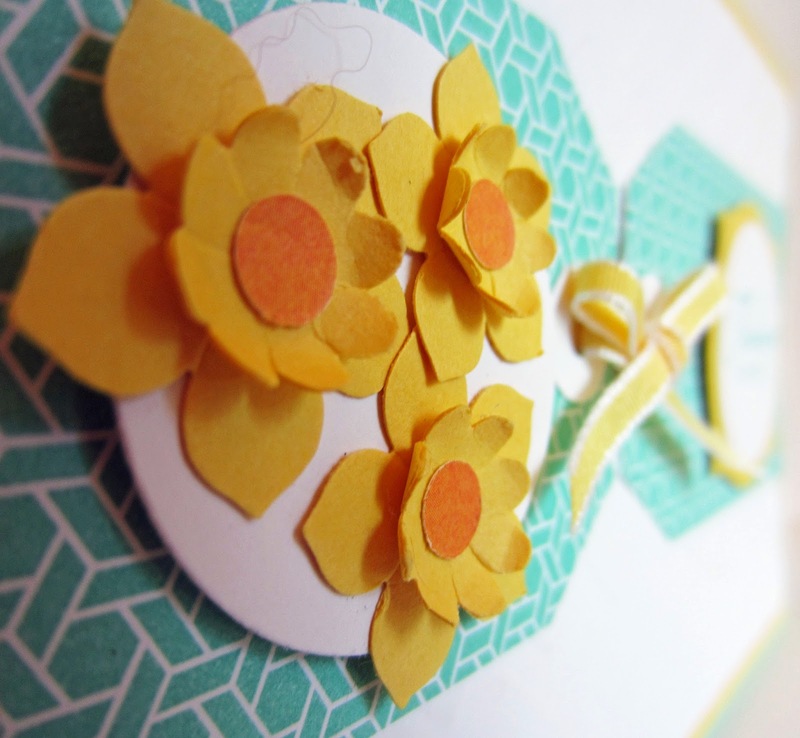 Adhere the circle to the yellow frame, then attach this to the larger tag with two Stampin' Dimensionals. There! Now, go forth and cheer someone up with a cute card you created yourself! This is so detailed and so adorable! I love it! Love this one. Thanks for sharing with Adorned From Above's Link Party. Have a great week. That is so cute. Love the flowers and the way you used the tags.